After seeing the movie, come on down for some real time training! Rey and Kylo await! 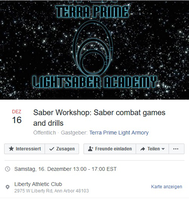 This workshop we wil focus on the games and drills with two people. It promeses to be a fun day so come on down! Space is limited, reserve your space now! Call (734)665-3738 and ask to sign up for the saber workshop on June 10th.